Verizon is currently hosting a “Red Hot Deal Days” event from today through May 12 (this Sunday), so if you were in the market for a new Big Red smartphone, now wouldn’t be a bad time to look. Well, assuming you aren’t interested in the Galaxy S4, since that won’t be out until May 30. But if the GS4 isn’t on your radar, you’ll find deals on the RAZR MAXX HD and regular RAZR HD, RAZR M, Incredible 4G LTE, Blackberry Z10 (hah! ), and more. The DROID line is headlining this show, with the RAZR MAXX HD at $149 on contract, RAZR HD at $49, and RAZR M and Incredible 4G LTE for free. The Samsung Galaxy S3 (16GB model) is also there for $99 on new 2-year contract. 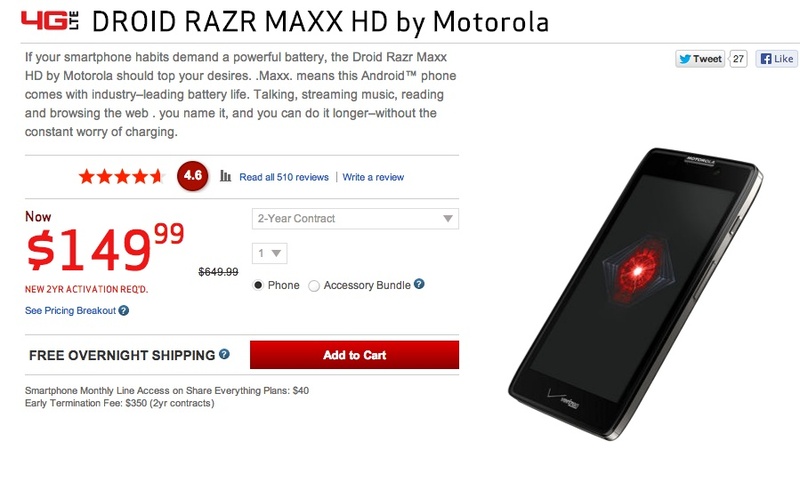 Keep in mind that Amazon will beat almost all of these prices, starting with the RAZR MAXX HD at $99 on contract.